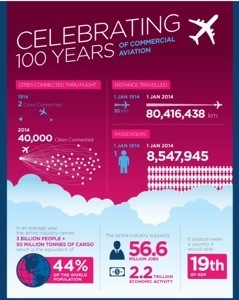 2014 is a special year for all of us, it marks 100 years since the very first commercial flight, and in that time, haven’t we all come such a long way? Here’s a message from a face you might recognise, Mr Harrison Ford, who dropped by the IATA annual general meeting to help celebrate the 100th anniversary and join in with #Flying100 through his own special, little message, we hope you enjoy. Nice be a part of it!